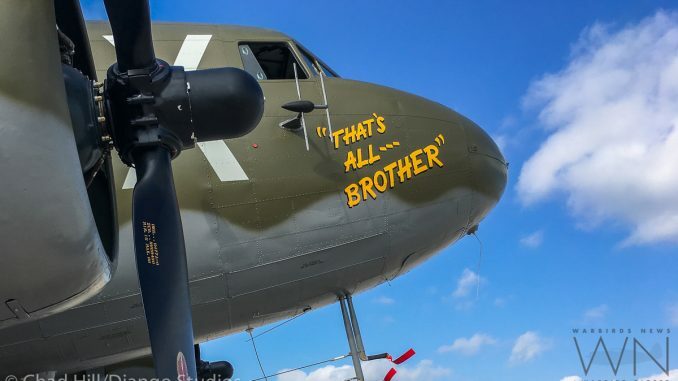 As many readers will know, the Commemorative Air Force’s historic D-Day veteran C-47 Skytrain That’s All, Brother recently regained her nose art from the time when she led the main 82nd Airborne paratrooper fleet over Normandy on the night of June 5th/6th 1944. 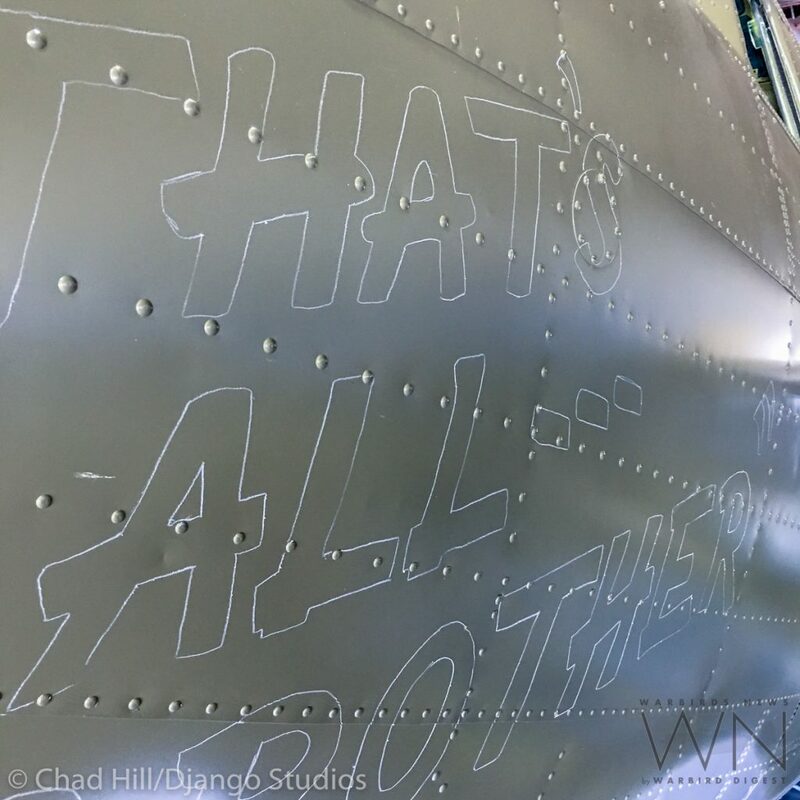 This was an important symbolic step in the refurbishment of this iconic aircraft, so WarbirdsNews sat down with the acclaimed artist, Chad Hill, who earned the honor of recreating those famous letters on the Skytrain’s nose. 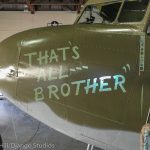 WN: How did you get to paint the nose art for That’s All, Brother? 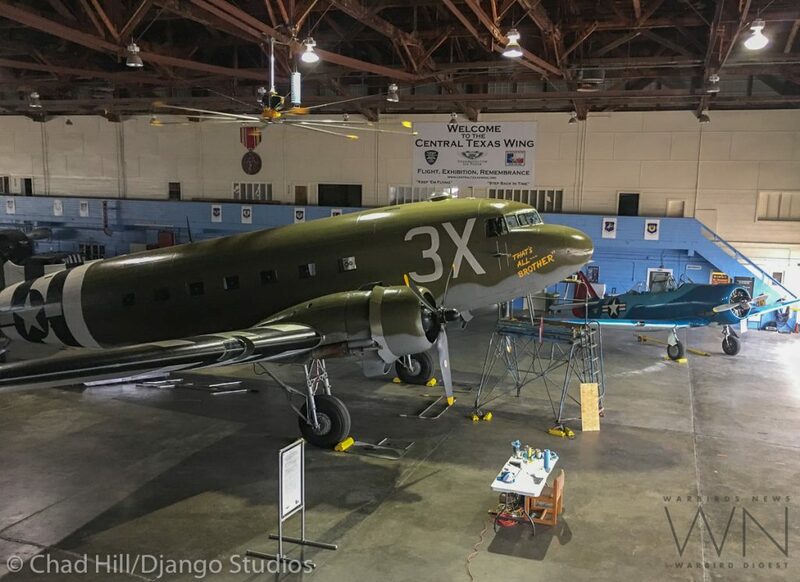 CH: Keegan Chetwynd from the CAF called me a couple years ago and told me about the plans for the restoration of the aircraft and asked if I would be interested in painting the nose art. 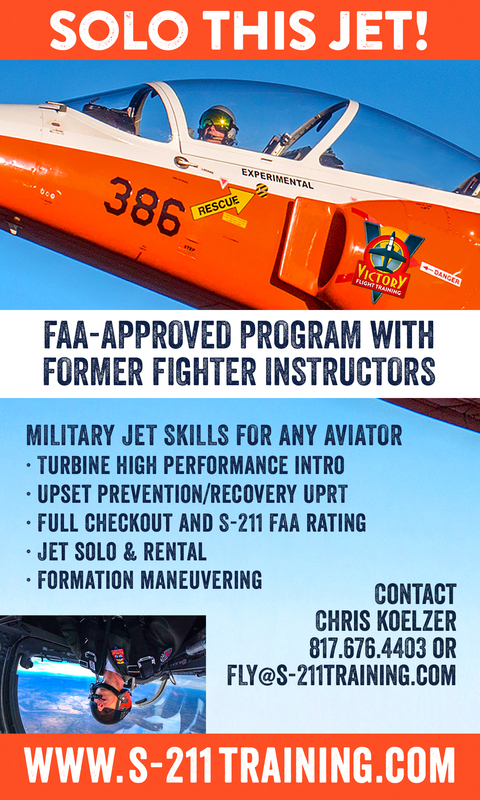 Since that time, we worked together on several CAF graphic design projects, but he always would keep me up to date on the progress. 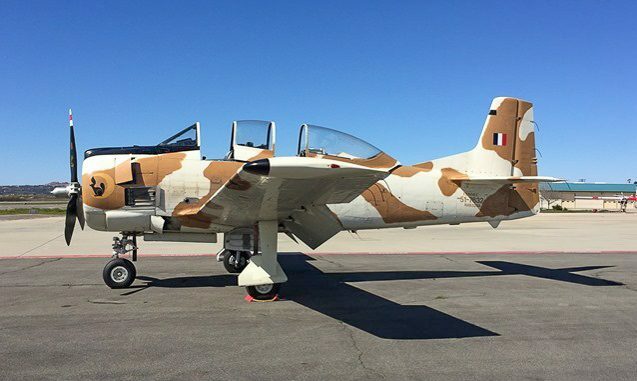 Then last month, Andy Maag from the CAF CenTex Wing called and said they were ready to move forward, so we made the arrangements to make it happen. 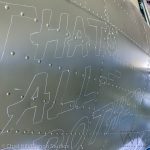 We discussed the two different techniques to get the art onto the aircraft that I use; sketching it directly onto the plane using a grid system drawn onto the fuselage in 2” squares to map out the location and each letter form. This technique is good if the art is to be painted at an event if the event is long enough for people to get a real period correct demonstration on the process. 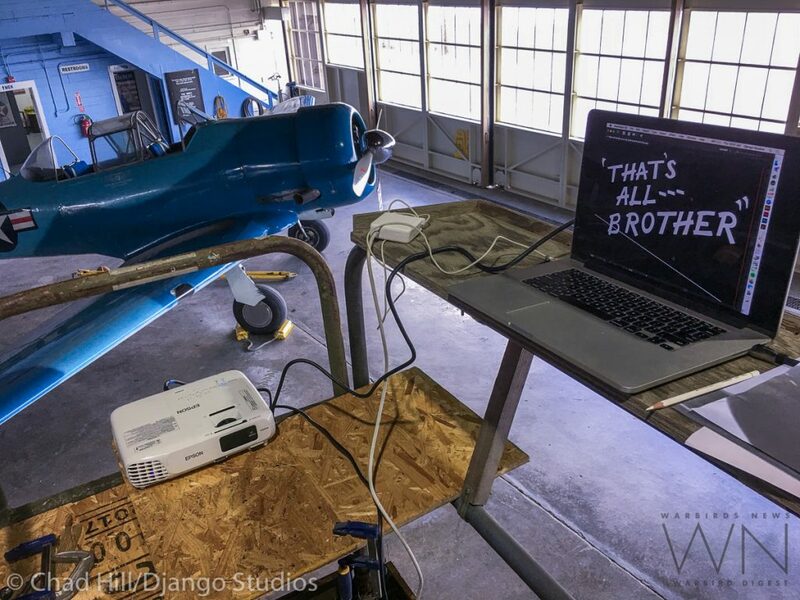 The other method is to project the art via laptop and projector onto the fuselage. 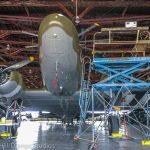 This process allows me to adjust the art on the screen as it’s being projected to get it exactly where we want it based on historic photos. 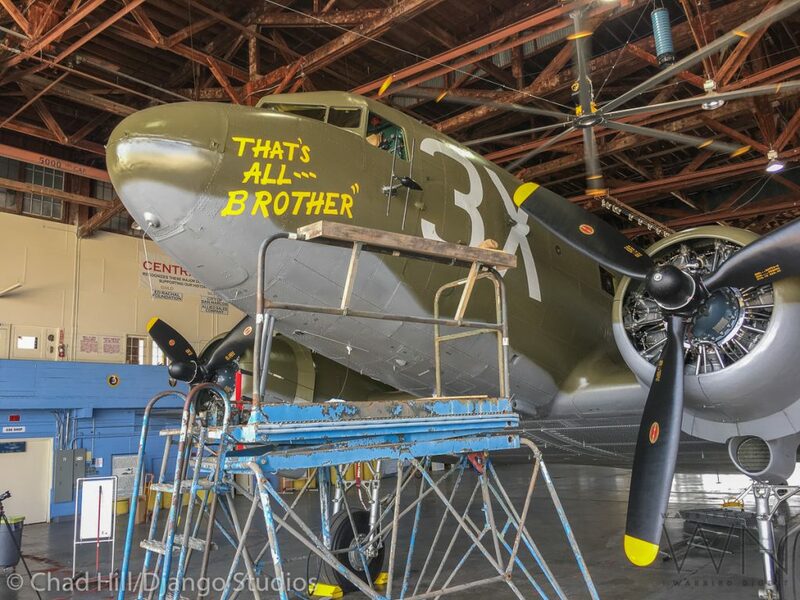 We both agreed that projection would be the best method so that the nose art would be as close to the two original photos as possible. WN: What kind of research have you done to prepare for this task? 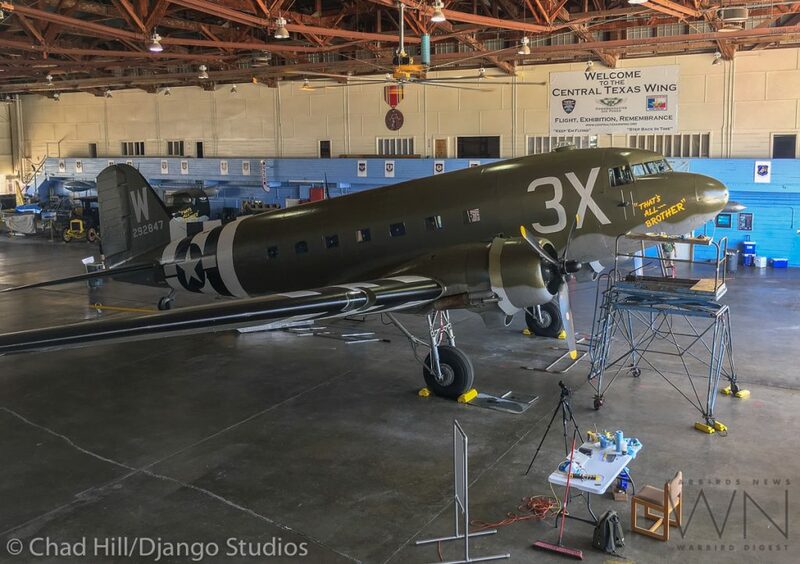 CH: With this particular project, the restoration team was really lucky to have two images of the aircraft, taken from a 1944 D-Day film. 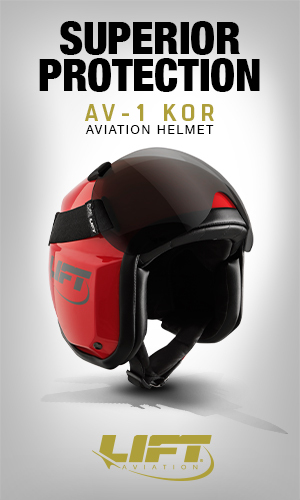 The image of the left side was really great. I took the photo into Adobe Photoshop and skewed the image to account for the perspective of the nose so I could start with somewhat “flat” art. From there I imported the photo in to Adobe Illustrator to begin drawing each letter one at a time. I’ve been a graphic designer for 26 years and typography is very important to me, so I studied the letter shapes in the photo and matched them as closely as possible. 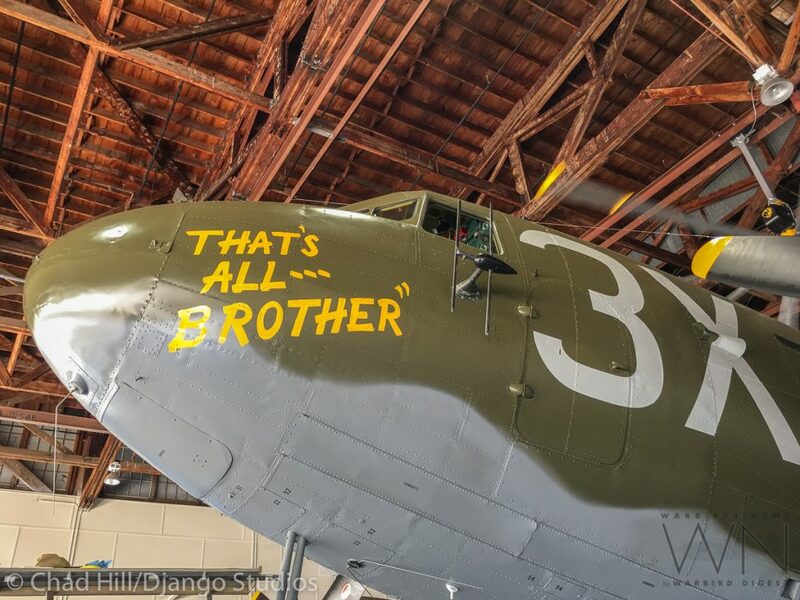 The left side was missing the beginning quote marks in 1944, so they are missing today in 2018. For the right side, we were lucky to have a photo at all to work from, but the quality was pretty poor. We could see that the art was similar, but not exactly the same. It was not as wide and smaller in scale. 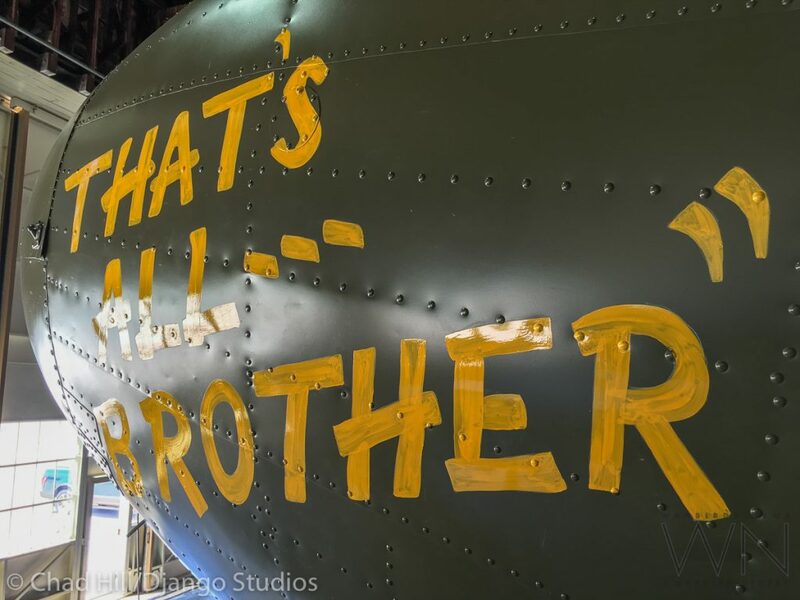 Being hand painted, there is no way that it was exactly the same as the left side, so I took the art file from the left side and began to modify each letter to be similar but different from the left side. This also helped with the narrower width… The Ts in ‘That’ and ‘Brother’ seemed to be narrower on the right side, and the Rs seemed to have shorter “tails” so I adjusted the letters accordingly. 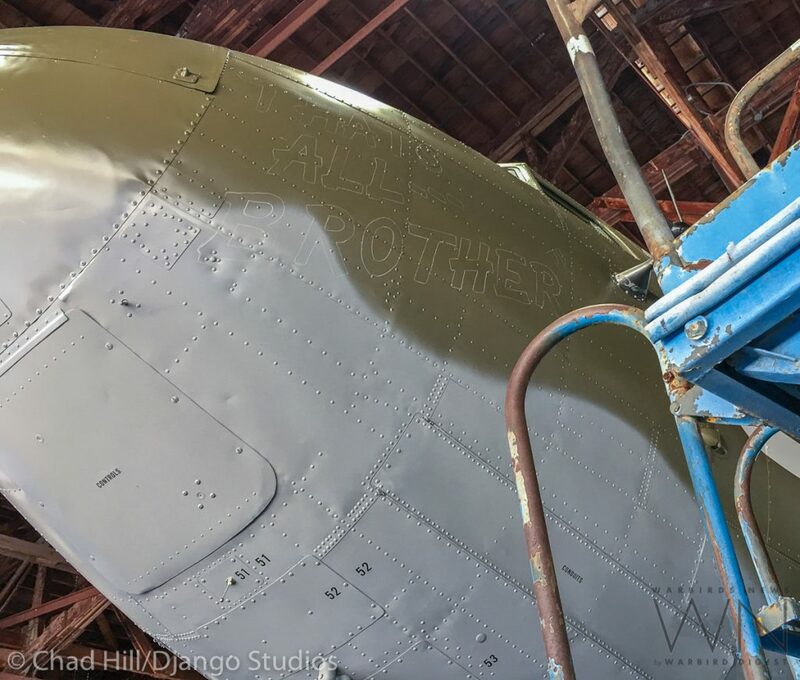 On both sides, at the time of projection, Andy looked at the photos from the floor and gave direction, while I fine tuned the letter forms and placement on the fuselage to try to get as close to the original photos as possible. 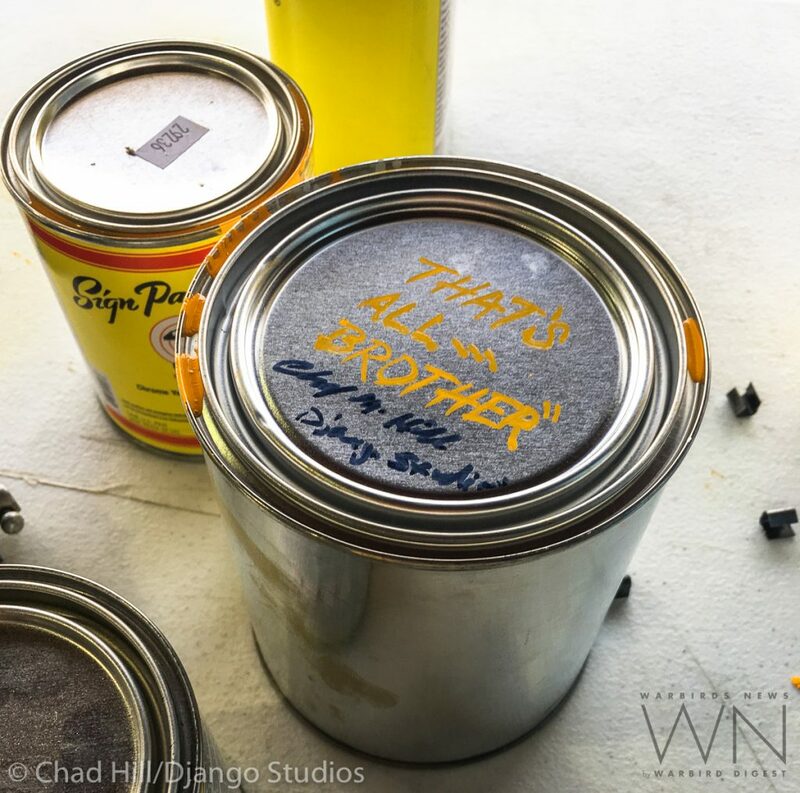 WN: What kind of paint have you used? CH: I use 1 Shot Sign Painters enamel with a #10 lettering brush. 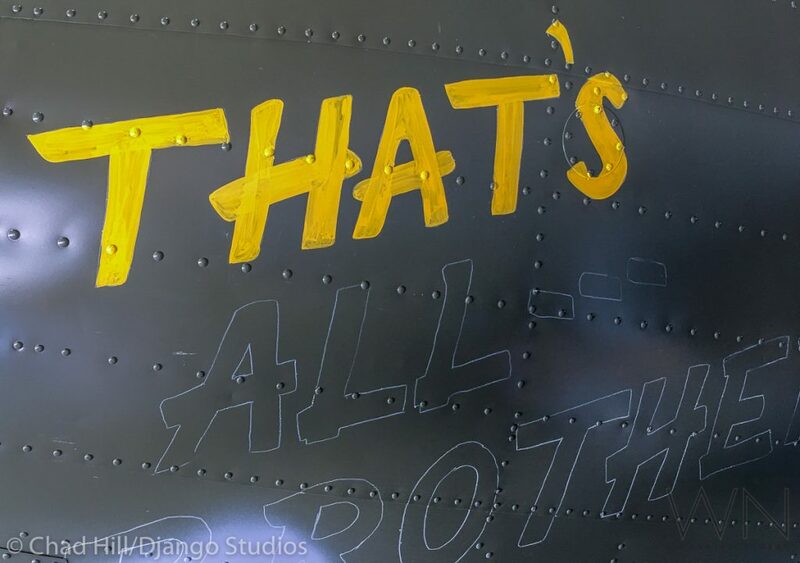 We decided on FS614 for the yellow, so I mixed up the color starting with 1 Shot Chrome Yellow for the base paint. 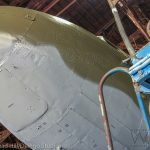 For this particular project, I knew that the daily 99°F Texas temps would be an issue with the paint drying before I could get it from my palette to the fuselage, so I used Hi Temp Reducer to slow the drying time down. It was a great help, but the paint drying too quickly was still a challenge. I got into a rhythm dipping into the paint and reducer before each stroke and it worked out well. The adjustable hard stand that I used was a big help as well. I had plenty of room to move, go up and down to get to the most comfortable position to paint, and a shelf for the paint, reducer, reference photos, and bottle after bottle of water to combat the heat! 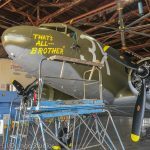 WN: When and how did you get into painting nose art for warbirds? 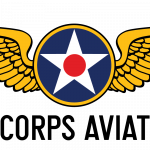 CH: My Dad, Gary Hill, and my uncle Bob Hill took me to my first air show in 1977. 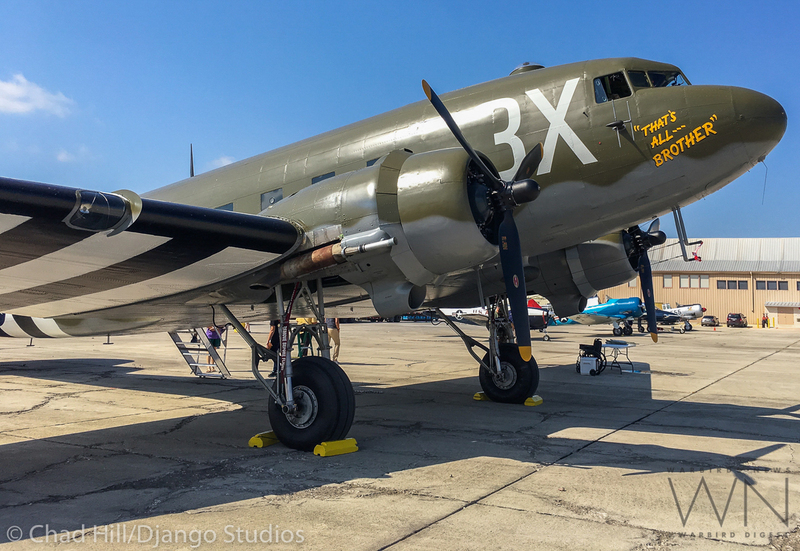 I was immediately drawn to the WWII aircraft. 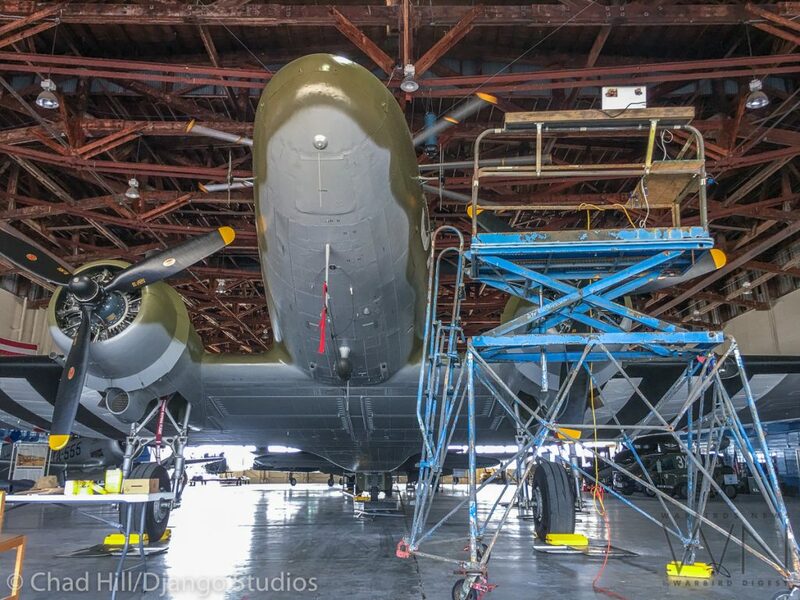 My Mom, Kitty Hill had taught me how to draw, and I immediately started drawing airplanes and building models. 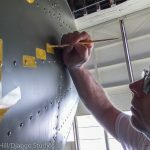 One of the first projects was hand painting nose art “Show Me” on a scale model of the CAF Missouri Wing’s B-25 in 1988, because you couldn’t get decals back then like you can today. 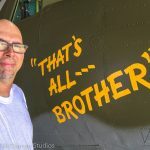 As I began my professional career as a graphic designer, I really began to study the nose art and appreciate the paintings as an art form. 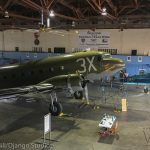 With the advent of message boards, I found the Warbird Information Exchange web site, and came across Gary Austin, who was working on bringing the CAF’s [Consolidated Liberator] Diamond Lil back to an A-model configuration, and documenting the process on WIX. 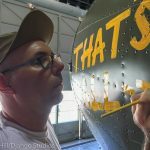 As the weeks went on, Gary seemed like a great guy, so in early 2007, I got brave one day and messaged him about the plans for new nose art. 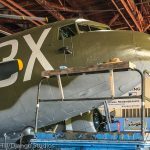 He said the General Staff hadn’t decided on a plan yet, but were leaning towards going with the name “Ol’ 927” in reference to the tail number found in some Consolidated documents. As the discussion progressed he invited me to submit some sketches for nose art concepts, which I excitedly worked up and sent to him. 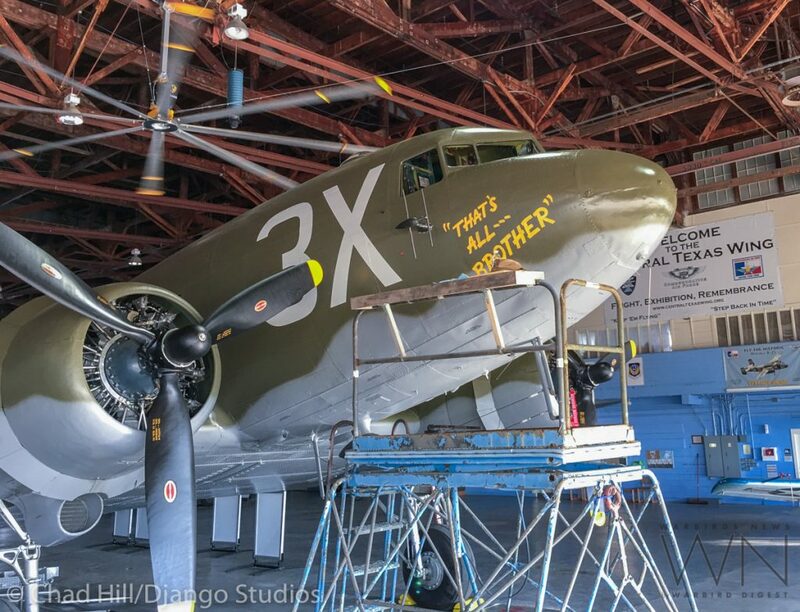 Gary called me and said that they liked the sketches and asked if I wanted to come to Texas to paint the nose art! 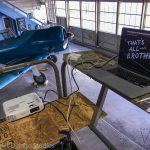 While I had painted small projects before, I hadn’t done anything of that scale and magnitude, so I asked my Dad, and friends Sean Cowger and Mike Hede to come along to help. 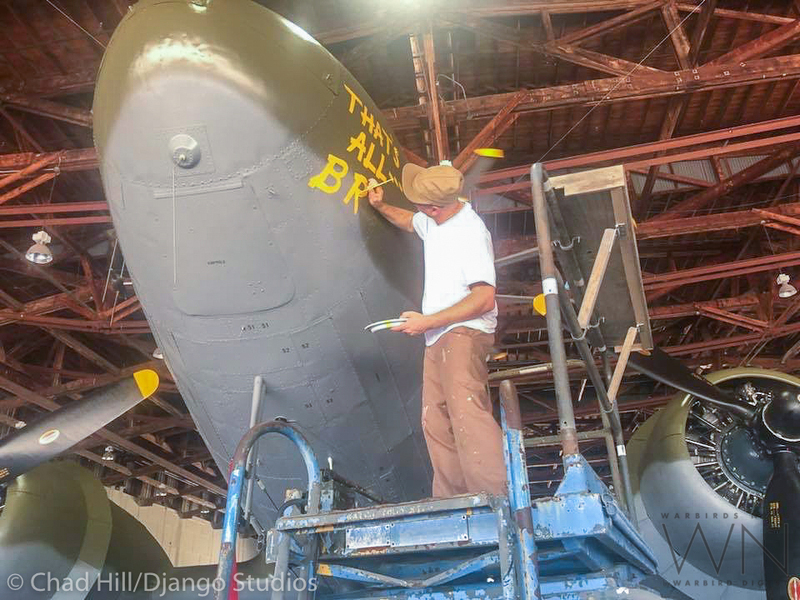 Sean was also a fellow artist, so his experience was a great asset for us to complete the 5’x5’ design on both sides of the B-24 in four days. While the art only lasted five years before the change back to Diamond Lil, it was a remarkable experience that none of us will forget. 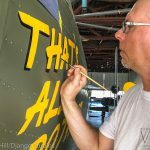 Every time I work on a project, I smile and think of Gary Austin, and remember his friendship and how he launched me into painting nose art. 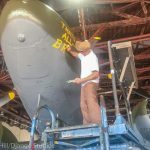 WN: What kind of research do you do before you paint a nose art panel? CH: The research depends on the project. In this case, I had great photos to work with. 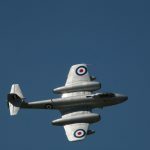 But in cases where a photo may not exist, or if I am creating something new, I will start with looking at as many photos as I can from the particular fighter or bomber squadron that the aircraft is representing. I’ll look at the style of art and the lettering. 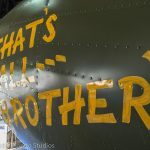 With each squadron or group, most of the nose art was done by a particular guy, and as you study the photos, you start to see his style emerge. For example the lettering will have similar traits. The girls or characters are rendered in a similar style. As I start my sketches, my thought process takes me to what would he have done if a crew asked him to do this plane? 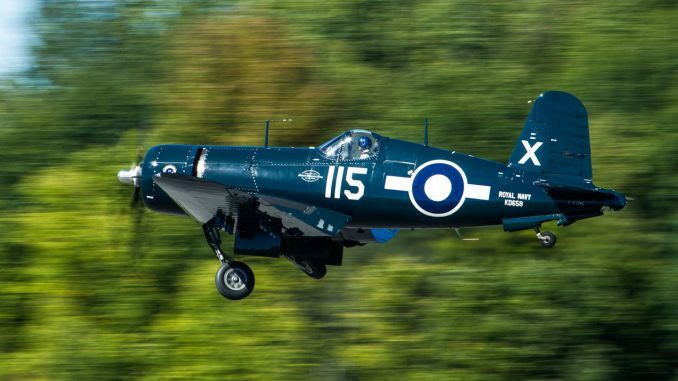 And I’ll try to come up with a concept that looks not only period correct for the time, but period correct for that particular squadron down to the correct style of lettering. The accuracy is important to me, even when I’m asked to just create new art. 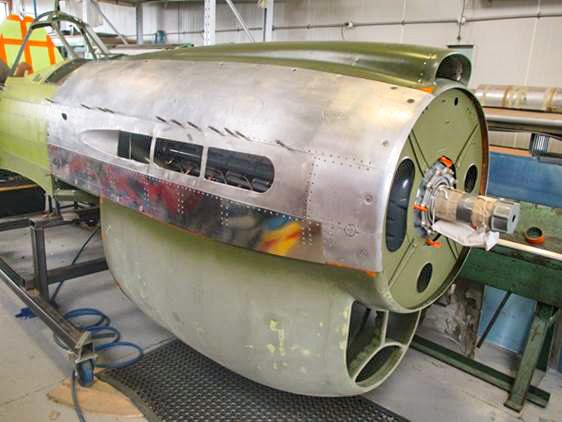 Many of the girls in the nose art were based on poses from magazines by artist’s like Alberto Vargas and George Petty. 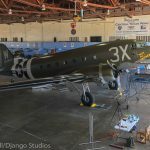 If the aircraft markings are representative of the Summer of 1944, then I will only look at reference material from August 1944 and earlier, because a pin up that was published in February 1945 would not be accurate, even though I’m designing it in 2018. It’s a type of detail that defines me as nose artist and historian. 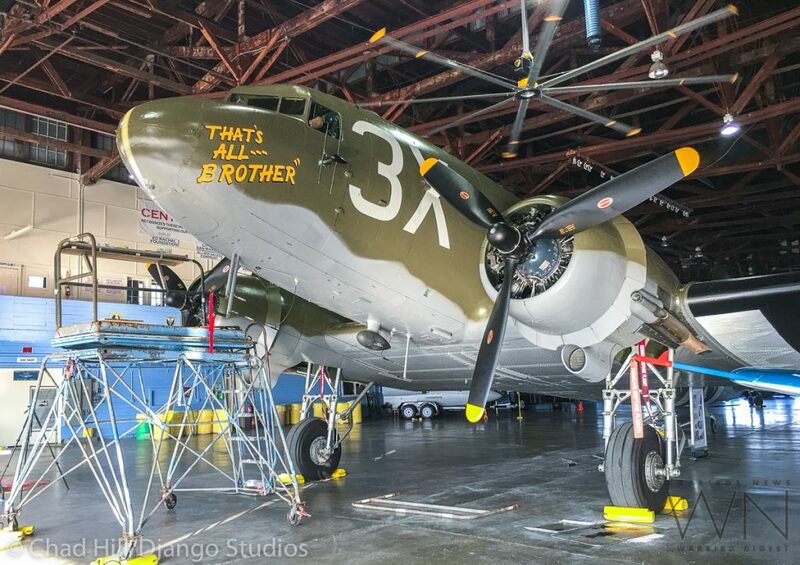 I’m really encouraged by the recent trend of uber-historical accuracy, even in the nose art. 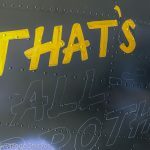 In the not too distant past, you would see a plane represented with vinyl graphics and what ever font they could find that was close enough to the reference photo, which always confounded me. 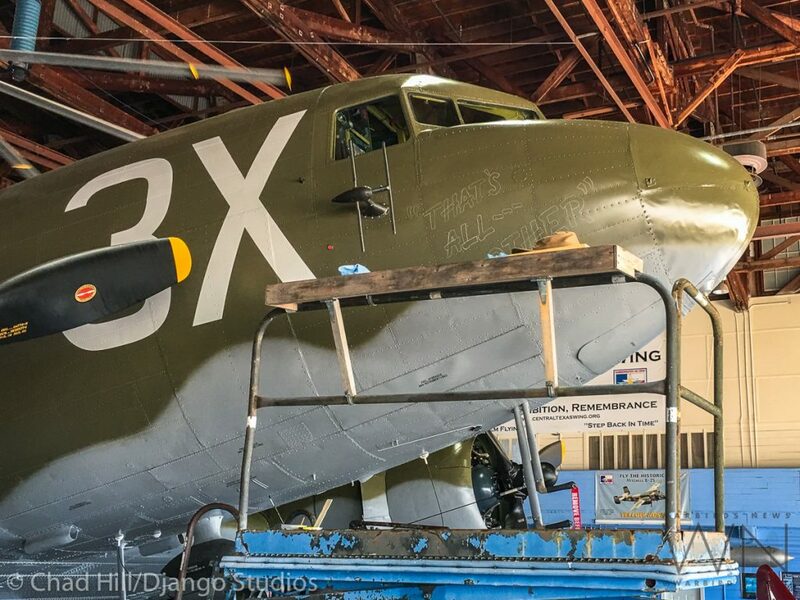 I never could understand how an owner could spend literally millions of dollars on a restoration, but not follow through to get the nose art as period correct as the gun bays or radio equipment. Thankfully that is changing. WN: What are your sources? 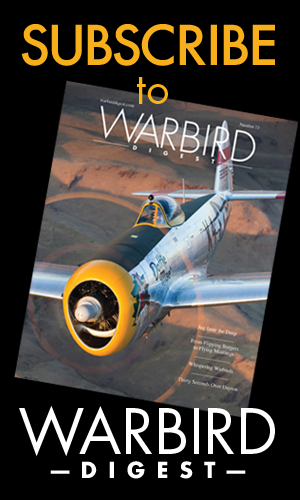 CH: I have a pretty good library of books on nose art like Gary Velasco’s ‘Fighting Colors’ and ‘Talisman’ by John and Donna Campbell, ‘Paint Locker Magic’ by Jim Meehan and Bill Tate, as well as Jeffery Ethell’s ‘WWII Nose Art in Color’. 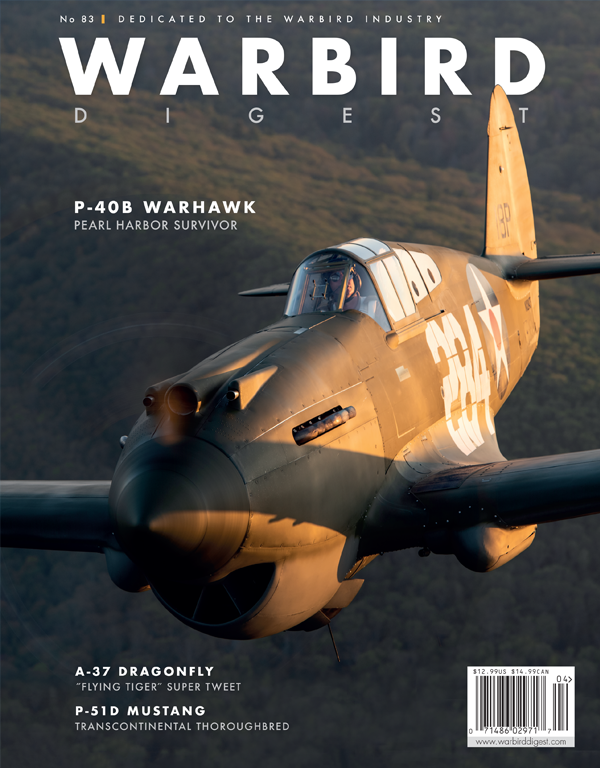 I also have tons of books of aircraft types as well as specific bomb or fighter groups. 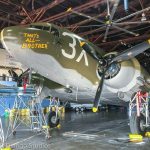 The internet has really grown into an amazing resource for reference photos and information on the USAAF. It has definitely become a tool for research unthinkable 30 years ago. 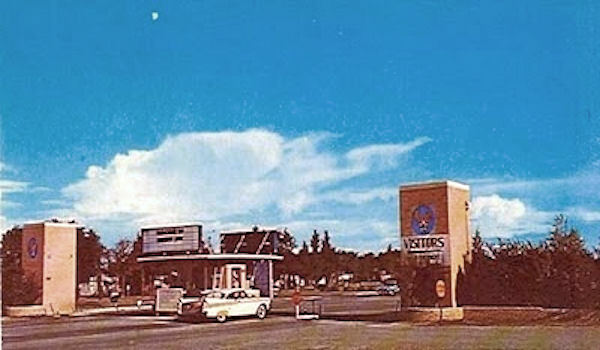 I also have a collection of original photos that I’ve purchased on eBay, and at estate sales, with the hope to write my own book on the subject someday. 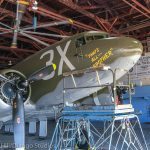 WN: What other airplanes have you painted? WN: Who is your favorite artist? 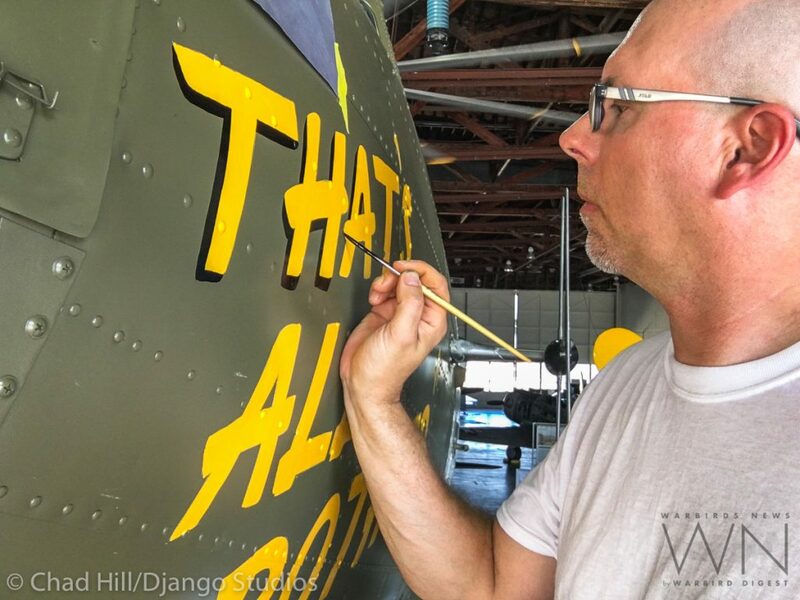 CH: For nose art, I’m a huge fan of Hal Olsen who painted mainly Navy Privateers on Tinian. He was an amazingly talented artist. I was fortunate to be put in contact with Mr Olsen through Bill Tate and was able to ask questions about his process from start to finish. 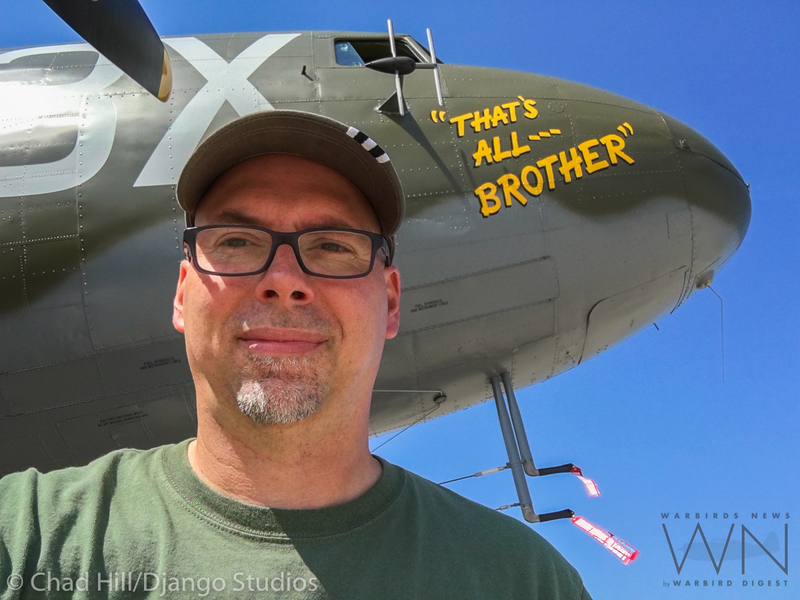 It’s always a pleasure to talk to any veteran about his experiences, and it was really amazing to speak to someone who actually painted on the planes that I had been studying photos of nearly my entire life. He was really nice and appreciative that I was helping to carry on the art form. 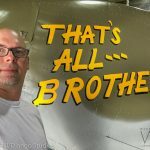 Chris Henry from EAA and I contacted the few museums with Privateers about recreating some of his art while he was still with us, but sadly that never came to be. 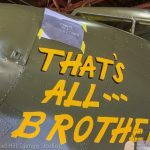 Don Allen’s nose art work in the 4th Fighter Group is right there for me as well. Alberto Vargas and George Petty are big influences, as well as comic book artist Bruce Timm. 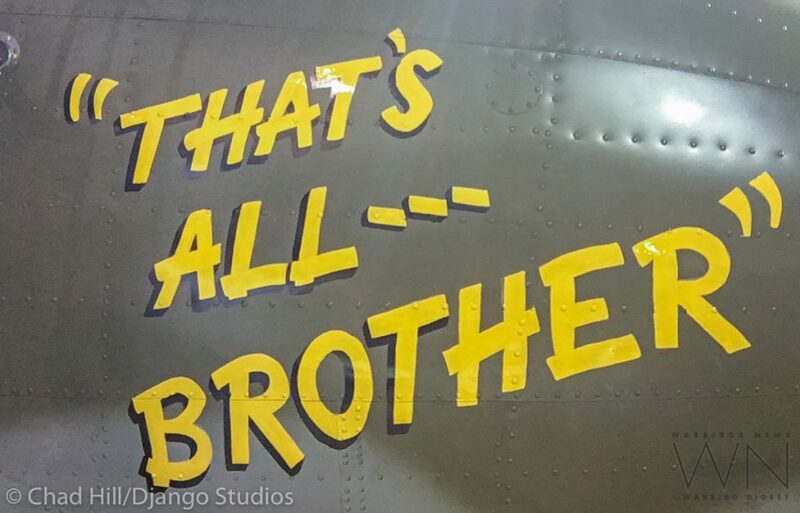 Disney’s contributions to art in WWII are huge and also a big influence for me as well. 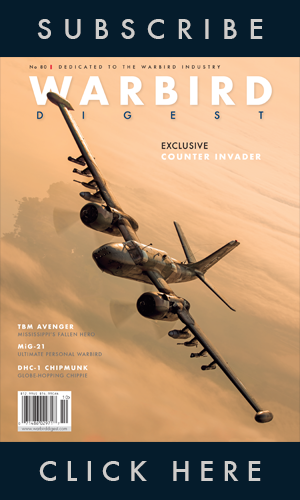 WN: What is your favorite nose art subject? CH: If someone asks me to create whatever I want, it’s going to include a pin up girl, of the period correct, non-PC variety. That doesn’t mean it will end up being vulgar either. There’s something about the beauty and style of the 1940’s pin ups that I’ve always been attracted to. 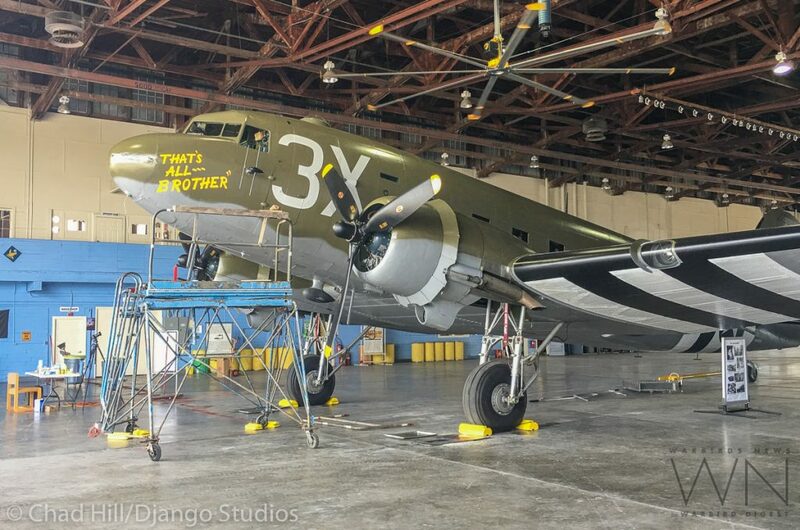 It seems that the majority of people today seeing the art on the planes don’t understand why it was there and why the subject matter was chosen by those young men in say 1944. It’s all part of the history and tells the story. I also like designing my own Disney influenced characters or animals. 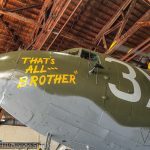 No matter the subject, they are all finished off by lettering that is appropriately period correct in design and style, and that is important to me. 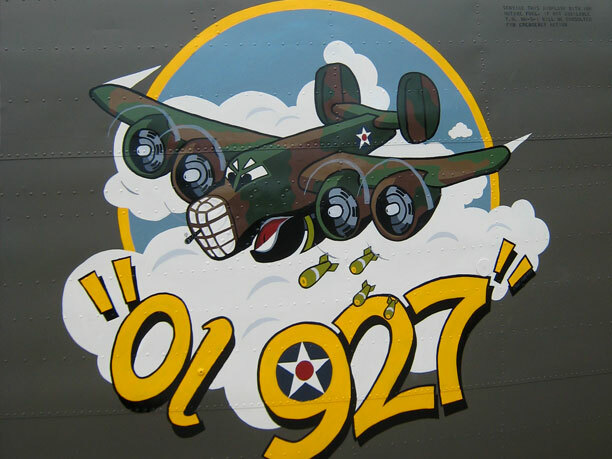 WN: What is your favorite WWII nose art? CH: It’s hard to pick a favorite! 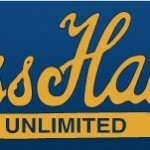 Anything by Hal Olsen or Don Allen. 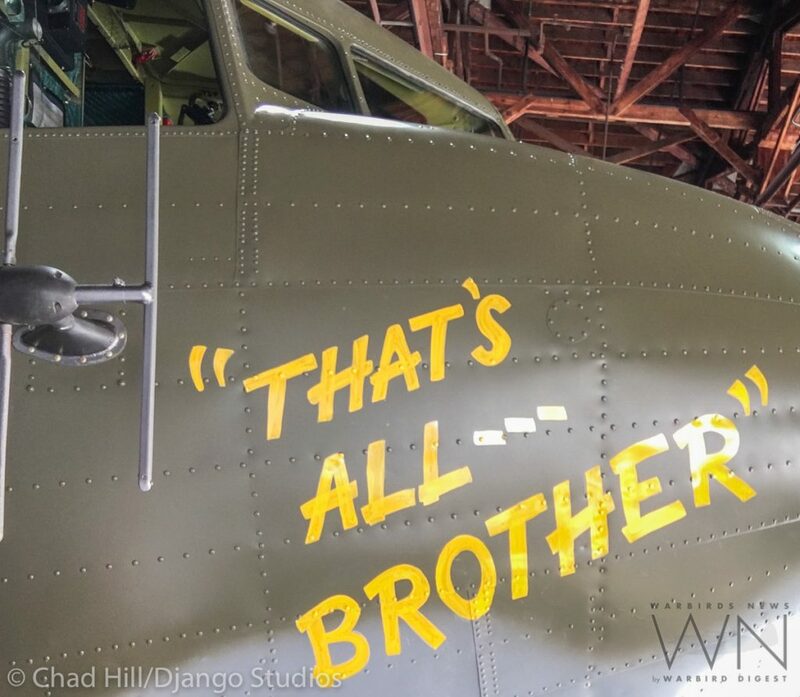 “The Dragon and it’s Tail” B-24 was amazing. 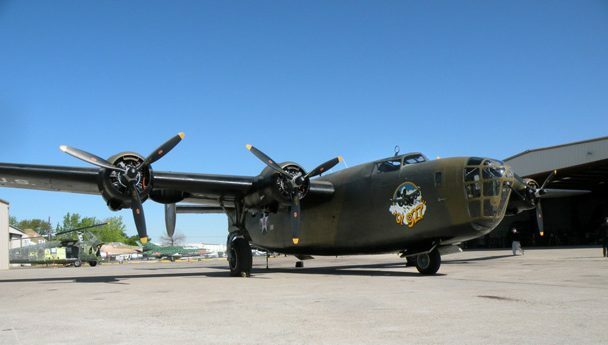 I would love it if the Collings Foundation would do another SWPA theme the next time they repaint their B-24. 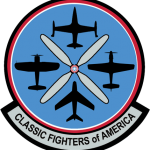 I also love the P-38’s from the 459th Fighter Squadron “Green Dragons”. The CAF’s surviving “Surprise Attack” panel was always iconic to me, as well as “Flaming Mamie”, which is a similar style to my work today. 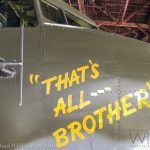 The CAF B-25 “Show Me” nose art circa 1987 made a lasting impression on me. 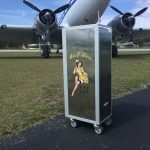 I don’t know who originally painted that first version of the nose art, but there is something about the pin up that has always spoken to me. About 8 years ago, I drew up a replica of the original version just for fun. 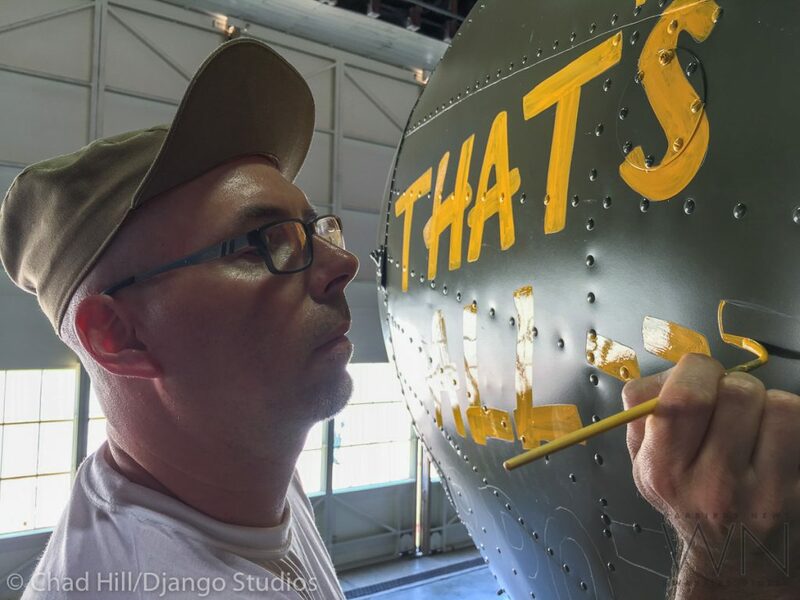 A couple of guys asked if I was going to hide my signature in the nose art somewhere. 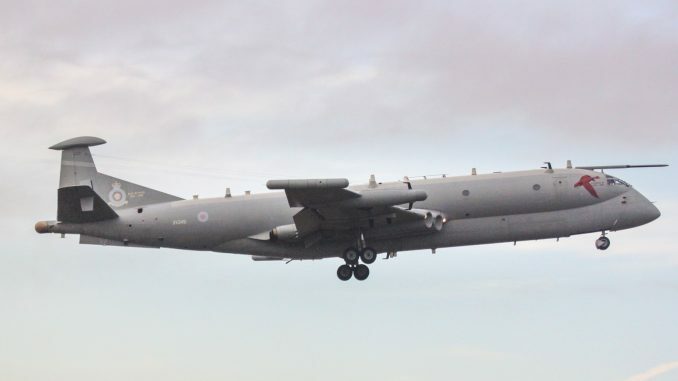 Honestly the thought didn’t even cross my mind on such a historic aircraft, especially when we were striving to make it as close to original as possible. I felt that my name didn’t really need to be there. 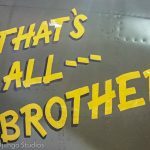 There are other places where my place in the story of ‘That’s All, Brother’ can be told. 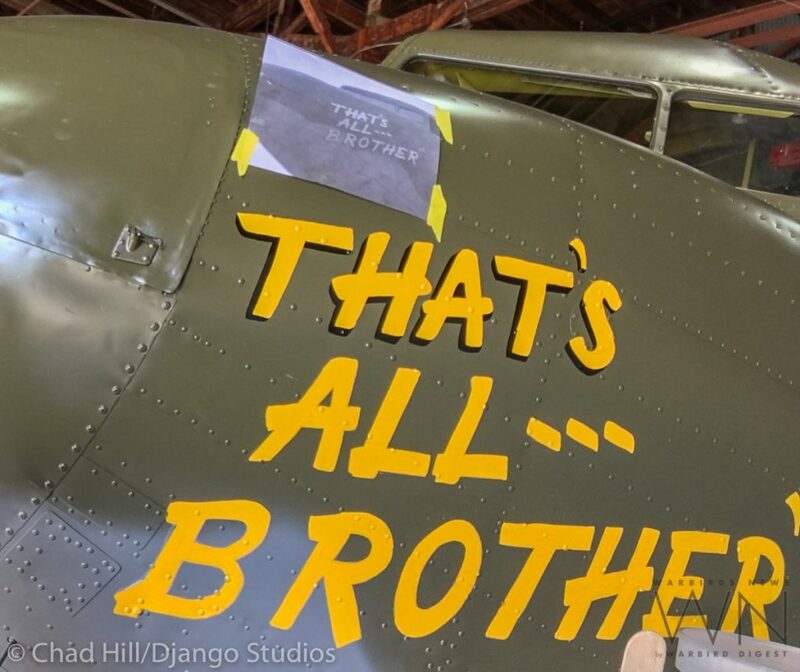 To that end, I painted “That’s All, Brother” on the lid of the can of the paint that I mixed up, and signed my name and Django Studios. The whole experience was one to not soon be forgotten. 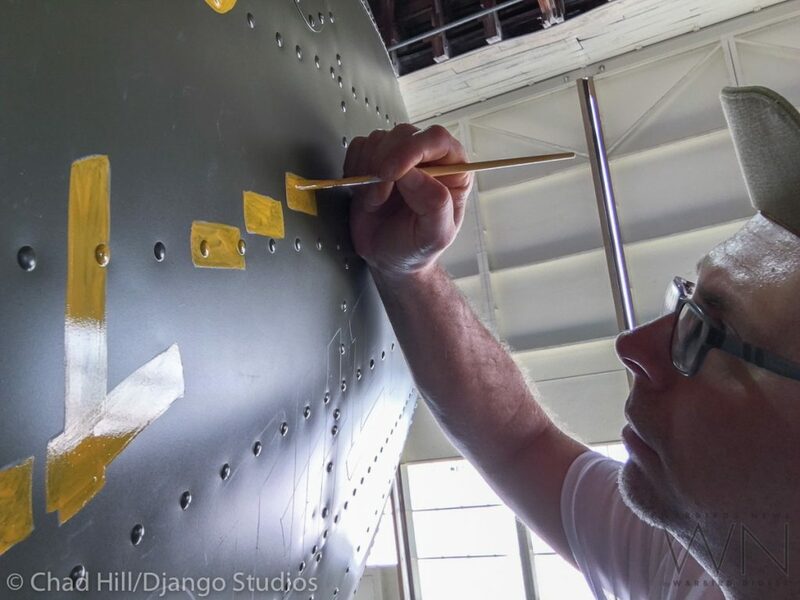 It was an honor to be asked to be the artist to paint the nose art on such a historic aircraft. Everyone at the CAF CenTex Wing was very friendly and great to work with. 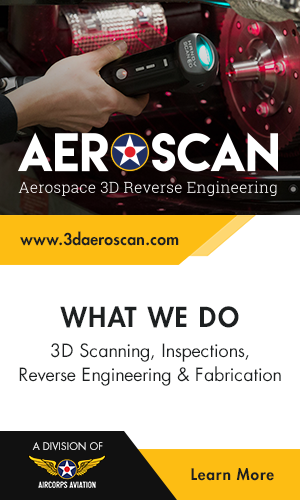 They were quick to address any question or request that I had, no matter how small. I hope to continue to work with them in the future. 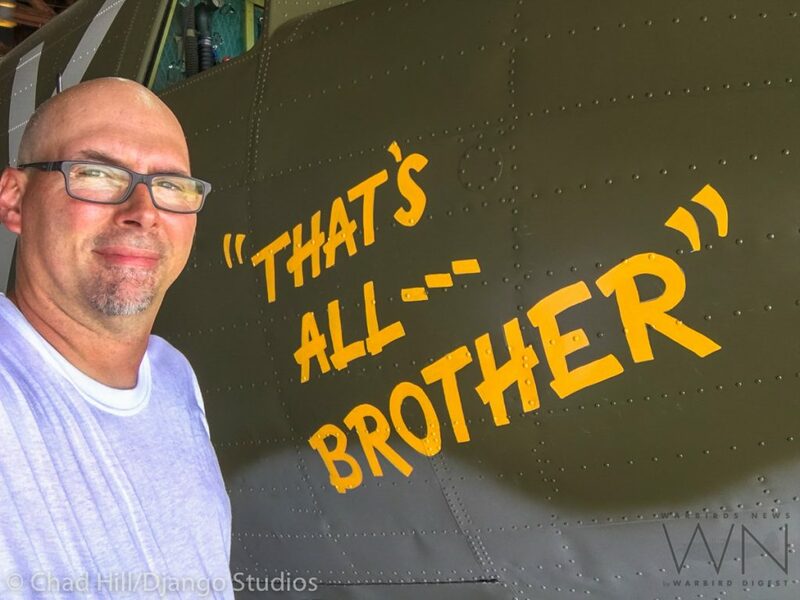 WarbirdsNews wishes to thank Chad Hill for taking the time to talk with us so candidly about his part in resurrecting the legend of That’s All, Brother. 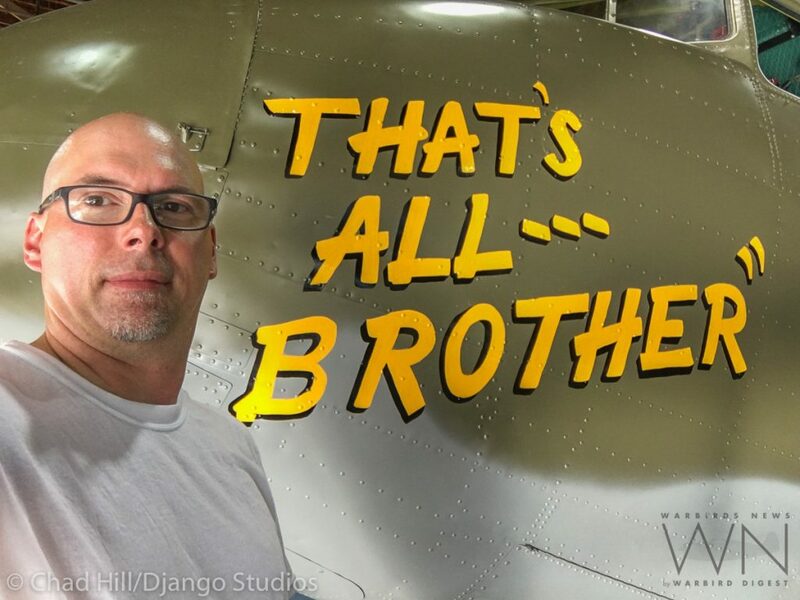 For those of you interested in checking out the work of this marvelous artist, be sure to check out Chad’s website Django Studios. Who knows, you may even commission your own work from Chad! 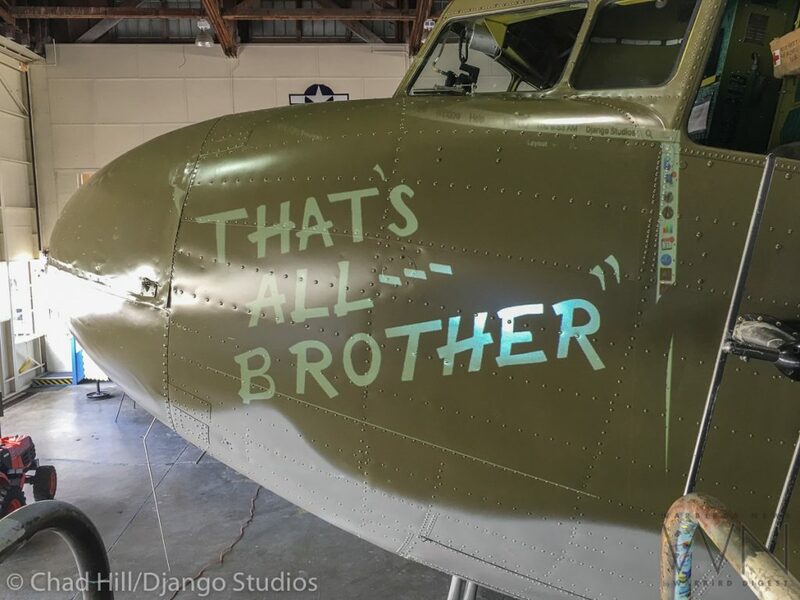 Douglas C-47 "That's All Brother"